Frog Callers are used to call the frogs because when the frogs come, so do the rains. When the rain comes you can also use it to call the dolphins. The purpose of this instrument is to call frogs and dolphins to ensure water and food for the people. The actual sound is very much like a frog when you hold the stick and spin it around. When you hold the stick in one hand and the bottom of the frog caller on the other hand and twirl the stick tightly backwards and forwards, it will also make the sound of a dolphin. 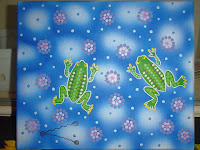 The frog callers are very popular with kids and make a fun birthday gift.